Home / entertainment / news / ROP / News roundup. So, yesterday, finally, MC3 (that's the Passenger Terminal Building at Muscat International Airport) was tendered. J&P came in the lowest price, with CCC following as second lowest. I guess the technical evaluation will now have started and assuming that J&P tick all the boxes that need to be ticked, they will be awarded the job, they're certainly a very competent Contractor. If you're thinking about a move to a new place in Azaiba or al Hail, do it now because I suspect that with the influx of people working on MC3, demand for housing in these areas is going to increase. Well done to The Sultan Center for seeing a market, and opening a supermarket right in Azaiba. I'm sure their money-printing press is working over-time at the moment. It also has not really been publicised, but I'm blogging it anyway, Galfar some how managed to get awarded the Ras Al Hadd Airport Contract. I'm literally blown away, how can a Contractor who has consistently failed to meet a single deadline on any of their infrastructure projects continue to be awarded work? Incredible, really. So these ROP fines... officially it's still not true, unofficially, its pretty obvious something big is going on: New ROP cars, new cameras, red-light camers, and presumably the ROP themselves are undergoing more training in how to police traffic - but who knows? So increased fines are actually a good idea, it's a stronger deterrant. RO 10 is not a significant deterrent, if you're driving a nice car and speeding, a flash for 10 is a minor annoyance, nothing more, and so it doesnt deter people as much as it used to. Inflation and all that. 10 fines costing RO 100, versus 10 fines costing RO 350, suddenly thats in the range of an annual insurance premium, and people will take more notice of their speed. People are starting to talk about Eid 2 holidays. From what I've been told so far, it looks like we'll get saturday - tuesday off (including a day for the National Day). Flights back to Europe are being booked already, with many people opting to take leave on the Wednesday and get 9 days vacation. I guess time will tell. I plan to spend Eid 2 camping here in Oman. 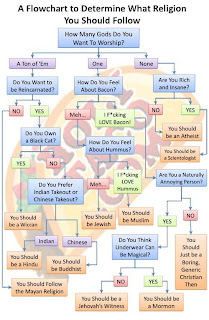 Finally, on Oman Forum, user Supermacs posted a rather amusing flowchart, copied below for your entertainment. The flowchart came from this website. What are the Chances for Bechtel combine to get the job given that their bid amount is L3 ? Tender Board has opened the bids for MC5 too which is Salalah New Airport tender. Nagaarjunba combine became lowest while L&T+Galfar and J&P submitted thier bidds as L2&3 respectively......Nadia will be happy that she can fly out to international dfestination from Salalah in the year 201???????? Sythe, i don't think you were "literally blown away"